Understanding how to read your Elastic Statement is an important step towards taking control of your finances. Your Statement will contain information specific to your Elastic Account, including how to make a payment. It will also contain important information if your Account ever becomes Past Due. Follow this guide to help you better understand terms and calculations appearing on your Elastic Statement. Please note: This is an example of an Elastic Statement. Not all Statements will look the same, but each will include the same basic information. Your Account Number is a unique number assigned to your Elastic Account. It is helpful to have this number if you are contacting Customer Support with questions either by phone, email or mail. If you make payments by check, please write your Account Number on the check or include the Payment Slip with your payment. Your Billing Cycle is set up at the time of application depending on how often and when you are paid. If your Pay Frequency is Weekly or Bi-weekly, you will have Bi-weekly Billing Cycles and Bi-weekly Payment Due Dates. If your Pay Frequency is Semi-monthly, you will have Semi-monthly Billing Cycles and Semi-monthly Payment Due Dates. If your Pay Frequency is Monthly, you will have Monthly Billing Cycles and Monthly Payment Due Dates. To initiate a Payment Due Date or Billing Cycle change request, please call us at (888) 225-0080 or email us at support@elastic.com. The Statement Closing Date is the last day of your Billing Cycle. Your Statement is generated at the end of the day on the Statement Closing Date and includes activity and fees assessed through that date. It is important to look in your My Account for the most up-to-date information. This is a snapshot of your Elastic Account on the Statement Closing Date. It totals the transactions and fees by category and summarizes the Balance changes on your Elastic Account during this Billing Cycle. Payment(s) & Other Credits displays as a negative number because it reduces your Balance. Cash Advance(s), Other Debit(s), and Carried Balance Fee(s) display as a positive number because they increase your Balance. 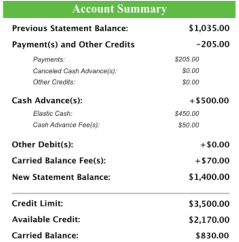 Under Payment(s) & Other Credits and Cash Advance(s), you will see itemized amounts in italics. Your Credit Limit, Available Credit and Carried Balance are as of the Statement Closing Date. The Carried Balance is calculated each Billing Cycle, it is used to determine the amount of the Carried Balance Fee charged for that Billing Cycle. If your Elastic Account has a Past Due Amount, or if it is in the Cooling-Off Period, your Available Credit is $0. For the most up-to-date information please visit your My Account. 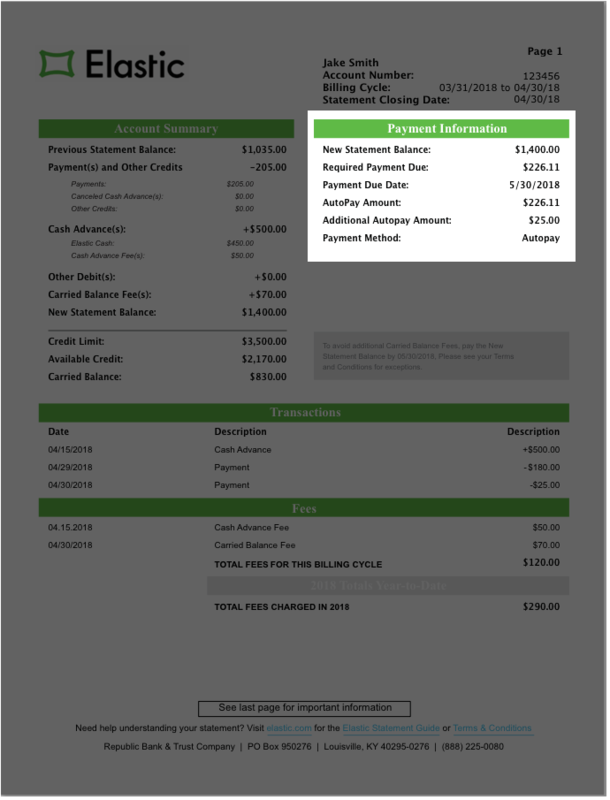 The Payment Information section provides important payment and Balance information. 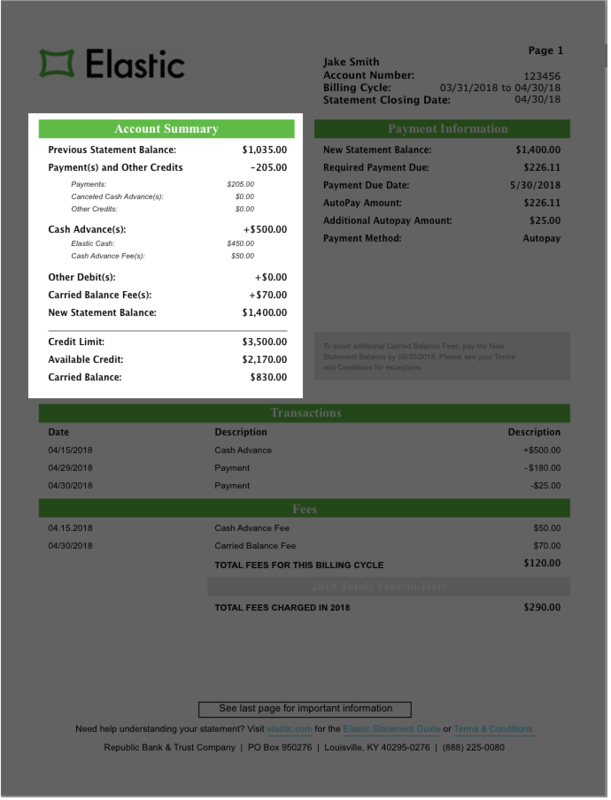 The New Statement Balance is the Balance on your Account as of the Statement Closing Date. Your Required Payment includes a portion of your Balance, plus any Carried Balance Fee and Past Due Amounts. It is due on the Payment Due Date. We will also tell you the date by which you need to pay your New Balance to avoid additional Carried Balance Fees. You have a variety of options in which you can make payments. While AutoPay is the most common you are not required to make payments using AutoPay. For additional payment options refer to Other Payments Methods on page 6. You may pay your Balance in full at any time without penalty. We also accept partial payments. 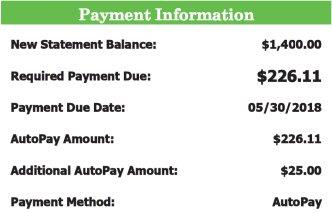 You may set up AutoPay and the AutoPay Amount appearing on your Statement will be debited from your Checking Account automatically on your Payment Due Date. If you want to make a change to your AutoPay, you must call Customer Service before 5:00 PM Eastern Time on the day prior to your Payment Due Date. You can also increase your AutoPay with an Additional AutoPay Amount. This will help you repay your Balance faster and reduce Carried Balance Fees. You can set up Additional AutoPay in your My Account. If you want to make a change or cancel, you must do so in your My Account before 5:00 PM Eastern Time on the day prior to your Payment Due Date. 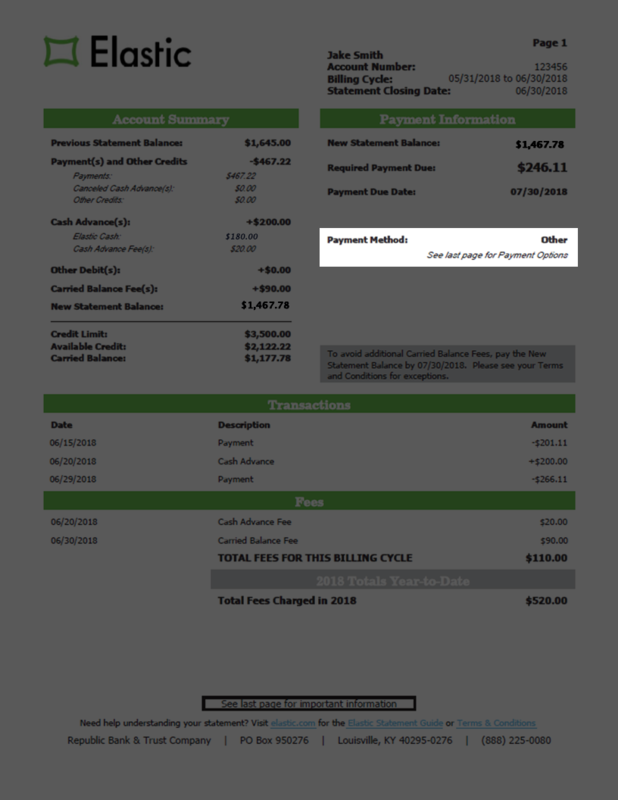 If you make any one-time payments during a Billing Cycle, please login to the payments page in your My Account to see how it impacts your AutoPay Amount for that Billing Cycle. If you have a Past Due Amount on your Elastic Account, your AutoPay Amount will not cover your Required Payment. You must make arrangements to pay all Past Due Amounts using another permitted payment method to satisfy your Required Payment. To discuss payment arrangements, call us at 866-689-0519. Your payment must be received before 5:00 PM Eastern Time on your Payment Due Date. You may make payments by mail, debit card, one-time electronic payment, or using the bill pay feature from your Checking Account. See Paragraph 13 of the Terms and Conditions for more information on your payment options. 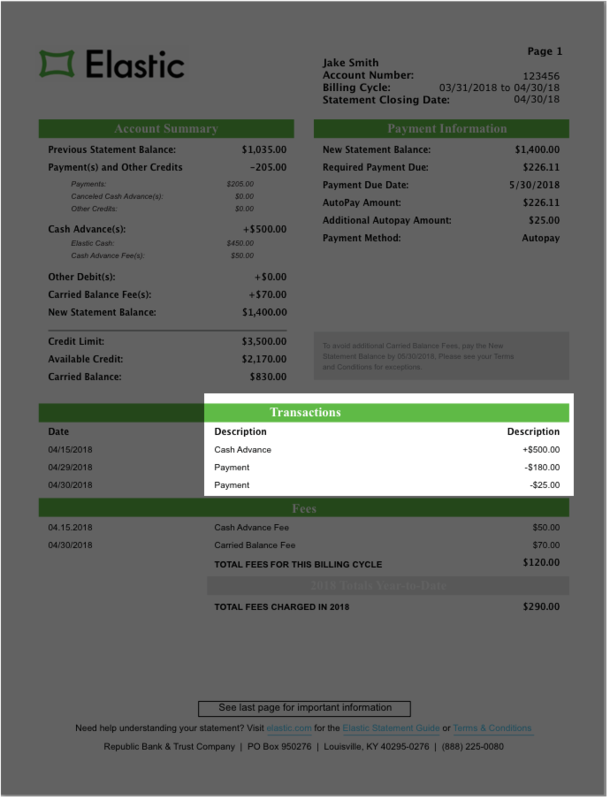 If you send a personal check, please include the Payment Slip provided in your My Account page or write your Elastic Account number on your check. 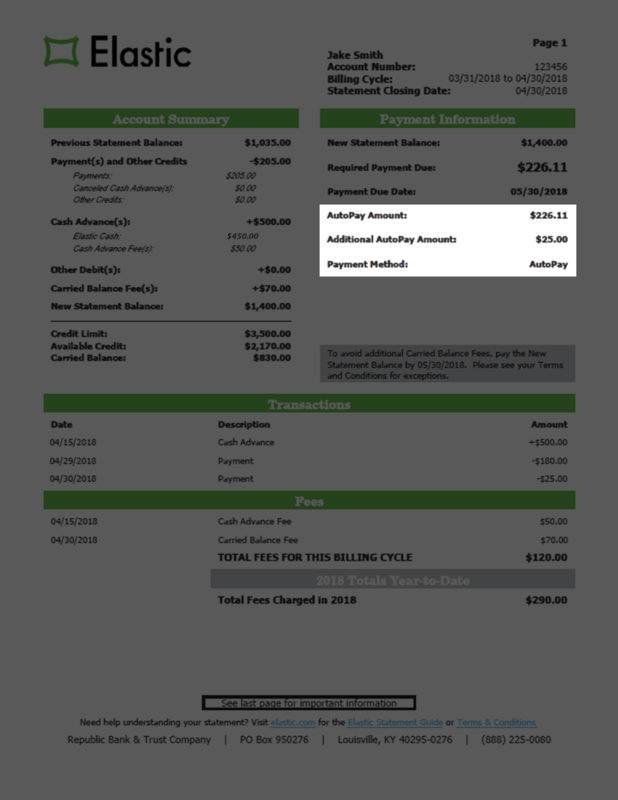 If you have a Past Due Amount on your Elastic Account, you must make arrangements to pay all Past Due Amounts to satisfy your Required Payment. To discuss payment arrangements, call us at 866- 689-0519. 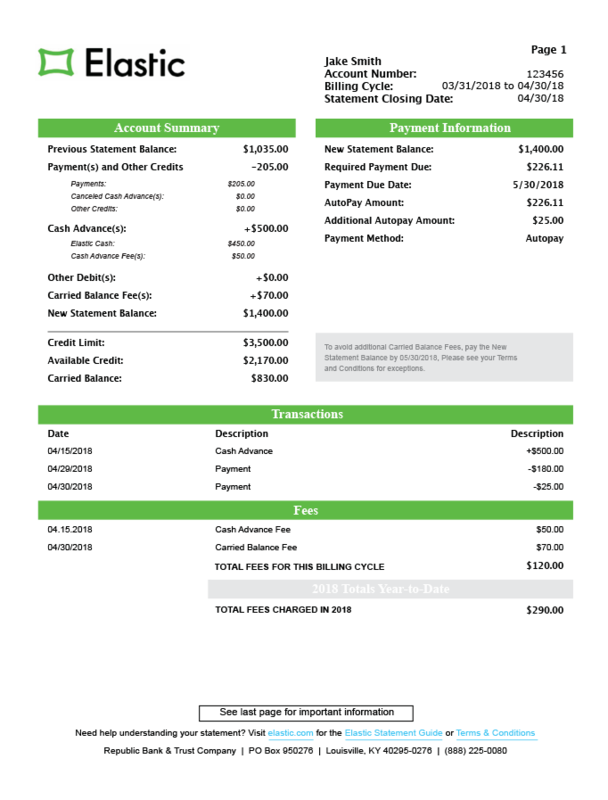 The Transaction section includes a description of the activity during a Billing Cycle listed by date and amount. The Cash Advance is the total of the Elastic Cash you receive and the Cash Advance Fee. Other transactions will appear in this section. This may include payments, cancelled Cash Advances, payment returns, credits, reversals, waiver of a fee, or any other transaction that increases or decreases your Balance. 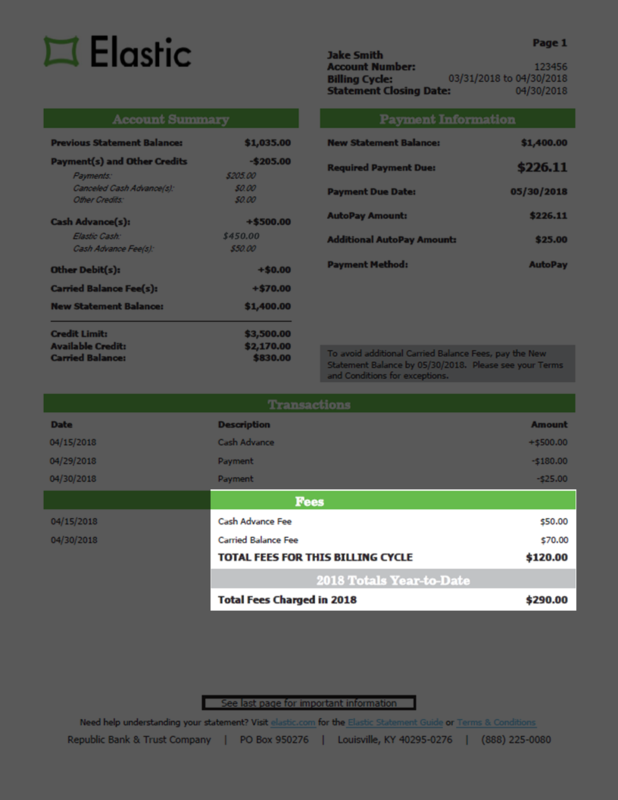 The Fees section details the fees charged during this Billing Cycle. They are separately itemized here by date so you can easily see your Fees each Billing Cycle and year-to-date. The Cash Advance Fee is the amount charged for each Cash Advance request and is deducted from the Cash Advance amount you request. It is 5% of the Cash Advance if your Billing Cycle is Bi-weekly or Semi-monthly, or 10% of the Cash Advance if your Billing Cycle is Monthly. A Carried Balance Fee of $5 - $350 applies if you have a Carried Balance greater than $10, using the Truth-in-Lending Disclosure Fee Chart.